Medical practice staff Avril Woodward (left) and Sue Palmer installing a specialist bed with the new intravenous equipment in the out-patients department. THE Friends of Frome Hospital are supporting an important new addition to the range of medical services for patients in the Frome area. Their funding has helped obtain specialist equipment, which allows an intravenous therapy service to operate at the Frome Health Park. The newly-installed equipment can be used for the management of a diverse range of intravenous applications from simple blood tests to more complex treatments for osteoporosis, or blood transfusions. On reviewing the intravenous therapy programme, Peter Smith chairman of Friends of the Hospital said, “Again we are delighted to support another service which will save Frome patients the inconvenience of travelling to other hospitals way beyond the town. 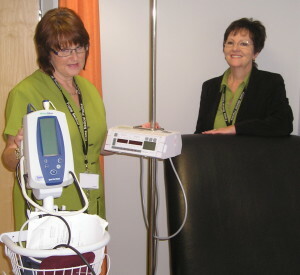 Below: Medical practice staff Avril Woodward (left) and Sue Palmer installing a specialist bed with the new intravenous equipment in the out-patients department.